Antoine Eito has lived his share of big moments with Le Mans, but Tuesday’s performance ranks close to the top. Le Mans finished the Basketball Champions League Regular Season riding a three-game winning streak. All three victories were needed to overcome a slow start and seal the ticket for the playoffs. It all came down to the final week of action and the home game against Anwil. Eric Bartcheky’s team never got to really control the match and needed a pair of clutch three-pointers from Antoine Eito to force overtime and secure the invaluable “W” after the five extra minutes. The 30-year-old French point guard is currently on his third stint at Le Mans. In 2009 he helped ASVEL win the French Championship, but was upgraded to an even more important role in his current club’s championship run last year. 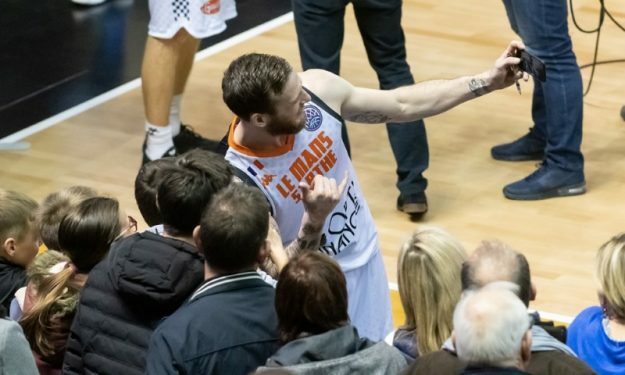 He also had two Pro A stints with Orleans and was a Vichy player from 2009 to 2012, but his 2018-19 campaign is his best yet, both in the BCL and the Jeep ELITE Pro A. His massive contribution in the Champions League’s final Regular Season Gameday simply added on his breakout season. Eito joined Le Mans for the 2012 French playoffs, returned for a two-year stint from 2013 to 2015 and made his latest comeback in 2017. He’s had his big moments, especially this year. His 8.8 points per game average in the French League is an improvement compared to his previous Pro A seasons. He’s even more effective in his first BCL campaign with 9.1 points, 4.4 assists and 2.5 rebounds per match. Stats are good, but clutch buckets are better. He took it on himself on Tuesday nailing two unbelievable shots beyond the arc to extend the Regular Season Gameday 14 match by five minutes (VIDEO). Asked during the presser about his clutch display, his unconventional second three in particular, he answered: “You don’t think about the shot. You take it because you have to take it. It’s the easiest shot to make this way. The brain wasn’t there anymore, I just took the shot”. The French point guard completed the game with 15 points, 7 rebounds, 6 assists and 2 steals in 36:46. After admitting he wasn’t really thinking before shooting his team into the extra period, he talked about the game against Anwil mentioning: “Basketball is a game of runs. You take baskets and give baskets. We fought. It was hard. It was a tough game”. On Friday (8/2), the French team will find out which team it will face next month. The next opponent will be Iberostar Tenerife, AEK or Segafredo Virtus Bologna. In any case, a new and tougher challenge will present itself. However, the first goal was to advance to BCL’s Round of 16 stage. “Obviously we are really happy to go through. We started bad. We had injuries. But we did it” Eito said. Le Mans didn’t begin the 2018-19 season the way they finished the previous campaign, not the way their fans expected. However, the team is progressing in time for the meaningful games that follow at all levels of competitions. Eito himself is among the main leaders of the comeback charge and hopes to build on his impressive performances.